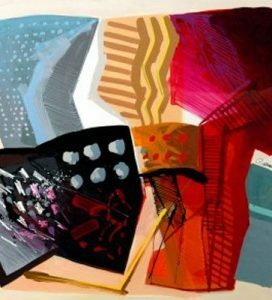 The mind of Calman Shemi is an abstract beyond description. Where some would see a sunset or a landscape by shape and color alone, Shemi feels the subtlety of the image and translates it into a unique expression. His work is a kaleidoscope of pigmentation and luminance. 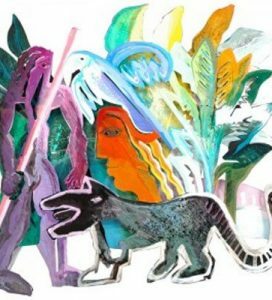 His ideas run the gamut from wild to practical, yet the paintings he creates are some of the most inspired and adventurous images in modern art. 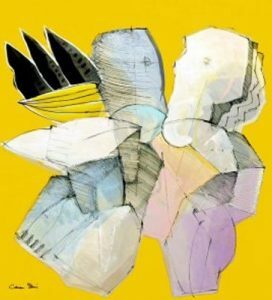 Calman Shemi, sculptor and painter, was born in Argentina in 1939. 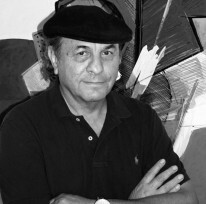 A graduate of the School of Sculpture and Ceramics in Mendoza, he studied under the Italian-Argentinean sculptor Libero Badii whom he credits with putting him on the right path. “He taught me principals, not only related to sculpture, but human and philosophic principals. 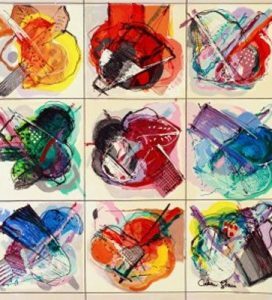 Shemi also carefully studied the work of such masters as Picasso, Caravaggio, Frank Stella and Matisse. “From each one of these great artists I learned something from observing them,” he says. Canaanite art was an effort to create a direct relationship with the land, bypassing historic Jewish connotations—hence the land’s primordial name is used. Canaanite works, with an emphasis on the inter-action of simple shapes, bear a deliberate resemblance to the sculpture and ritual art of early civilizations of the Middle East prior to Judaism, always with an eye to the fusion of man and the land itself. 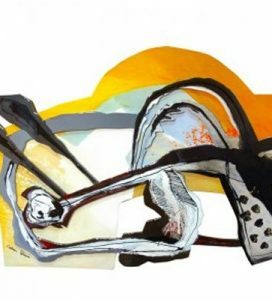 Though sculpture dominated his early years as an artist, in the mid ’70s Shemi developed the idea of the “soft painting” medium. 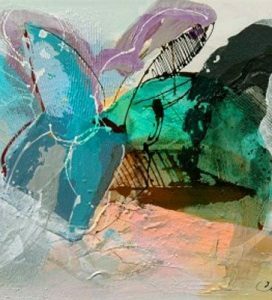 Beginning with a color drawing done to scale, Shemi layers onto the drawing irregularly shaped pieces of variously textured and colored fabrics. Using a threadless 9,000-needle sewing machine, the fabrics are meshed to one another and to the background, resulting in vibrant compositions infused with exuberant color and explosive movement. He creates his Lacquer Paintings by applying vibrant colors to wood or metal panel that has been gilded with gold or silver leaf, and sometimes both. After the paint has thoroughly dried, many layers of lacquer are applied to the surface giving it a glowing effect. Between each layer of lacquer the piece is hand-polished to give the surface its very shiny look. Window Paintings were born out of the idea that there is an irresistible curiosity to look through a window and see what is on the other side. 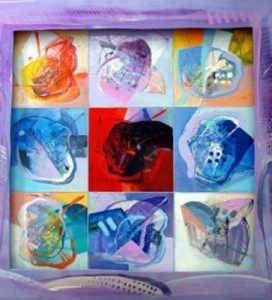 These paintings of his resemble an imaginative “shadow box” painting, that is to say, a painting inside a wooden box. After the painting is completed, Shemi attaches a hand-made wooden frame to the box. The frame is then gilded with gold or silver leaf, or both, and is layered with many coats of lacquer. 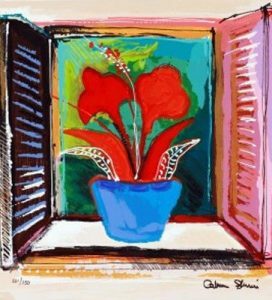 The effect of creating a painting that is housed in a framed shadow box gives the illusion of looking through a window at a landscape or a room, thereby making a contrast between the “outside level” and the painting within the deeper level. Shemi’s “lacquer” and “window” paintings are reminiscent of ancient techniques used centuries ago in Japan and China. “What interests me,” he says, “is continually researching and finding different techniques. The inspiration or muse comes to me while I am working. It doesn’t originate in my mind, just the opposite. It grows out of the paper or canvas. During the past eighteen years Shemi has held more than seventy one-man shows in the U.S., Japan, Germany, Spain, Belgium and Israel. His works can be seen in many public and private collections around the world. 807 E. Las Olas Blvd.